In today's Sunday Telegraph, Sean Rayment reports an officer in Afghanistan complaining that troops from Estonia … who were working alongside the Royal Marines were better equipped and had more reliable armoured vehicles than did British troops. Er… would that be because the Estonians are operating ex-British Mambas, as reported by this blog on 8 January and The Booker column last week? It would be too much to ask Rayment to read this blog but one might have thought that, at the every least, he could read his own newspaper – from which he might have learnt something. In this week's edition, however, the Telegraph's defence correspondent also tells a sorry tale that all four of the Army's mine protected vehicles (MPVs), "used to extract injured troops from minefields in Afghanistan", have broken down. 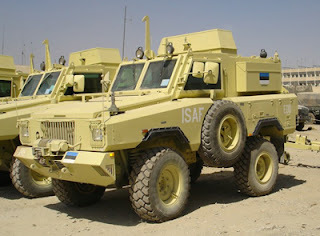 Commanders, we are told, regard the MPV (illustrated) as one of the most vital pieces of equipment in Afghanistan, where more than 10 million mines lie primed after 20 years of war. Since last June two servicemen have been killed in mine explosions and three have been seriously injured yet "one source" reveals that the farthest the MPVs have travelled outside Camp Bastion in Helmand has been just one mile. The same officer who complains about the Estonians is then cited as saying that "we need four more MPVs and we haven't got them". Although Rayment doesn't say so (possibly because he does not know), he is actually referring to the vehicle known as the Tempest MPV (illustrated above), which we described last June. Ironically, as we described then, the Tempests were the replacements for the Mambas which have been sold off to the Estonians. However, not all is lost. Despite the Telegraph conveying the view that there are only four MPV, readers of this blog will know that there are in fact eight vehicles (see also here), so somewhere (possibly in Saffron Waldron, where they were last seen) there are another four. It would not take very long to fly them out in a C-17 Globemaster, so perhaps the newspaper could not ask why this isn’t being done. Even then, there is another option. Once again this is not "revealed" by the Telegraph, but as we know, the Tempest was effectively the prototype for what is now known as the Force Protection Cougar, a fact we revealed last June. As we also know, the British have bought 100 Cougars under the name of Mastiff, some of which, we have been told, are destined for Afghanistan. 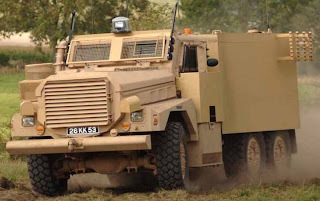 These are described by the manufacturer as a "mine protected vehicle" so, far from there being only four MPVs, there are a considerable number on their way – perhaps as many at 30. 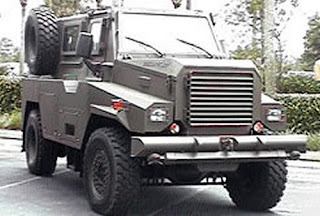 These, however – according to Rayment - are vital tools that have been refused by the Ministry of Defence. To that list, Rayment adds "night-vision equipment and thermal-imaging devices used to distinguish friend from foe" - the latter, as we know, being particularly useful for detecting suicide bombers. 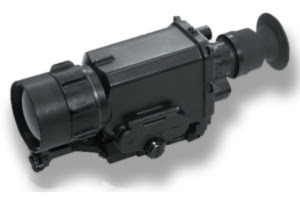 Something else we know is that these is no shortage of night vision equipment – the shortage was in thermal imagers, which was "revealed" by the Daily Mail in November. But, as we reported on this blog on 9 January, plans are in place to increase this number, by the procurement of over 300 additional sights. All that leaves little Sean with is the original litany of a shortage of helicopters and troops, which makes for rather a thin story, especially as he does not bring in the issues raised by the use of Apache helicopters to carry troops in last Monday's attempted rescue. Fortunately, the Sunday Telegraph's alternative defence correspondent, Christopher Booker is on the ball. Genocide one or genocide two? "I know who my comrades are"
Whom is one to believe? Now will they do something? How is the new boy doing? Could the Iraqi MOI be winding up AP?